First thoughts: It sounds pretty cool. I’ve always thought that the costume design for Captain America has been fantastic, and almost timeless. The wings and boots may have been a bit much, but for the most part, I think it still translates well. The artist renderings seen on joblo’s site are really something, given that they were only working on his description! Comic costumes rarely translate well into movies (see the 1980’s Captain America movie for proof! ), but lately it seems technology is allowing us to make more realistic fake costumes. I can’t help it. Here’s a link to that nasty old Cap costume: Yikes! All this is well and good, but it’s returned my thoughts to my own country and its super heroes (or lack thereof). Ever since I was a kid, I’ve been a huge fan of Alpha Flight, the John Byrne created “Canadian X-Men”. The costume design for Guardian was perfect. I mean, check this! Absolutely amazing. How great would that look on the big screen? Of course, if anything was made, it would be a Canadian production and probably have to incorporate Anne of Green Gables somehow. Hmm. Nevermind. 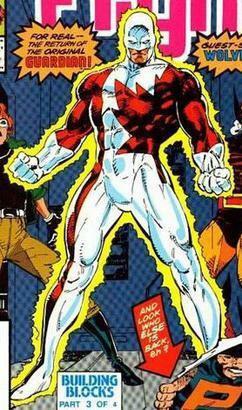 There’s also Captain Canuck, which I’ll freely admit to never having read, but the costume is nowhere near as cool. And that’s what we’re going for here, the power of symbolism. I’d considered trying to invent my own Canadian superhero during my early teenage years, inspired as I was by Alpha Flight, but also terribly frustrated at their humble comics – but never created anything I felt would be suitably awesomesauce. The idea was returned to me last year during the whole Olympic hockey uniform kerfuffle, where Team Canada was told they wouldn’t be allowed to wear their traditional uniforms. Wouldn’t a hockey uniform based on that Guardian costume look sharp? I’m going to have to photoshop something into existance some time soon and see.